Calvin is going Grundy over Max Gawn? WTF? Has he lost his marbles? After playing 19 games in 2015 to average 91, Grundy stepped it up another level last year and averaged a huge 101. But what really impressed me about Grundy was the way in which he finished the season… averaging 119 in his last five games. That’s numbers like a pig. In fact, his first half of the year was rather slow where he only clocked up 3×100+ scores in his first 11 games. He ended the year with 9×100+ scores in his last 11 games at an average of 113.5. Did you hear that? 113.5 in the last half of the year. Everyone raves on about how Max Gawn ended the year and how he is a ‘must have’ from the word go in 2017. Max and Grundy ended their last 10 games at the same rate, and if you want to get picky and right down to the dirty digits… Grundy averaged 0.1 more. By selecting Grundy over Max, you’ll be unique. 31% of coaches currently have Max Gawn in their teams. 23% have Stef Martin and only 15% are currently rocking with Grundy. You’ll be saving yourself $33,000 by going with Grundy over Max and based on their end of the season form… they’ll score roughly the same. Did you know that before today I had Gawn and Stef locked in as my rucks? You probably did, most people do. Did you know they share the same round 11 bye? That’s concerning my friends and that’s why I’ll be saving $33,000 and rolling with a Brodie/Stef combo. Please be advised: This may and most likely will change. Have a look at who Grundy will be competing against in the opening seven rounds. Talk about easy pickings for a gun like Grundy. After seven rounds… he’ll be averaging more than Max… oh big call. SNAP! Oh this is lit. I’ll struggle to find reasons here as… he’s a great pick and no one can bag you for going with him. He ticks all the boxes. Only small issue might be, unlike 2016, he may have to share some rucking duties from time to time with Lachie Keeffe… and that’s a huge MAY. I read into this two things…. Clutching at straws sorry… there are no bad reasons as to why you would pick up Grundy. KING – Reluctantly… I’ll call him a king although, he probably could be an ACE. Net year when we do the Deck of DT, if he is able to replicate what he did in 2016, then it’s a no brainer. As far as Rucks go, where do you see Grundy ranked by the end of the year? Nice read Calvin. Along with you and the rest of Australia I’ve been rocking a Gawn-Stef ruck combo. Like the fantasy expert that I am, I hadn’t even realised they shared the same bye round. So thanks for saving me from myself and pointing that out. Hugely tempted to save some cash and go with Grundy-Stef now, and wouldn’t be at all surprised if Grundy starts the year on fire. Cheers Calvin, another great edition of the Deck today. Have had Grundy locked in with Stef for a while..Today’s article has done nothing to change that…Didn’t realise just how good a run Grundy has to start the year….I think his ownership is going to jump considerably before the season commences. Stuff it I’ve gone Grundy and Gawn can’t see any change in role from second half of last season – that said did same last year stef and goldy stuffed my whole season – this year though I have tracked Gawn/Grundy pre season looked at team structure as well as first 5 round opposition and conclude is good bet – with no third man up I predict a rise of around 3-5 points per game each so I’m predicting a 110 plus avg each and in the top 15 players overall easy – big call I could get egg on my face here. I’m rolling with Gawn and Grundy at the moment as well, hope it goes well. You had me at ‘Brodie’.. He has Brody Grundy Face so is set for a huge year. My logic? Im a crows supporter but even when he played for us – Patrick Dangerfield had Patrick Dangerfield face. Just a look/face that sometimes you want to punch – and look what he did last year! 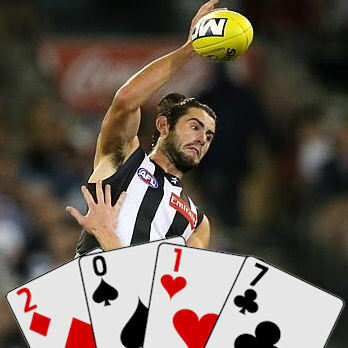 If Brodie Grundy has Brodie Grundy face again – he will do well. Also noted your Rd 1 – Rd 7 stats and think you put forward a convincing argument. That is some solid food for thought Dezza. I’m buying!